The St. Louis Mine is comprised of Arctic, Atlantic, Pacific, Baltic and Antarctic Lode patented gold and silver mining claims situated on 85.54 acres of property located in Clark County, Nevada. The St. Louis Mine is owned by Ireteba Mining Company, Inc. 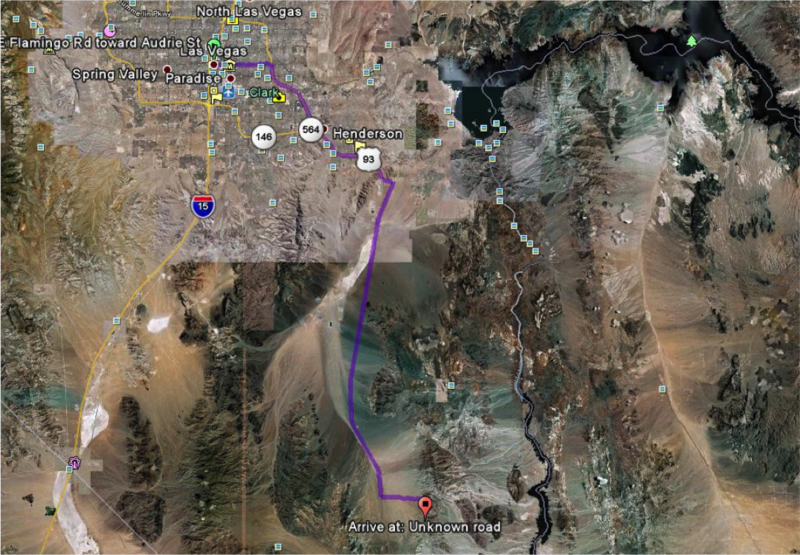 The mine is located approximately 4 miles north of Searchlight, Nevada (see aerial maps). From Las Vegas, take Highway 95 South heading east to Searchlight. Four miles before entering the town of Searchlight, turn east on Grandpa’s Road. Stay to the left on the Bureau of Land Management road for 3 miles. Once at the power lines, the property starts approximately 1 mile past the power lines and runs 150 yards over the top of the mountain. Roads traverse the whole property to the top of the mountain. Parcel ID 232-00-002-016. Those portions of Sections 28, 29, 32 and 33 in, Township 27 South, Range 64 East Mount Diablo Meridian in Searchlight Mining District, Clark County, Nevada as described as The Arctic, Atlantic, Pacific, Baltic and Antarctic lode mining claims as shown by Mineral Survey No. 3541 and described in Patent No. 245092, dated January 29, 1912. Certified fire assay work was performed on rock samples collected from the property to confirm gold and silver deposits (see attached “Fire Assays”). Ten rock samples were collected in July of 2012 showing promising results. An additional thirteen rock samples were collected and underground mapping was completed in August, 2012 that expanded the length of the gold-mineralized vein beyond the historical mine workings. More recent field investigations have extended the vein strike length an additional 1100 feet to the south of any historical underground mine workings which are estimated to have produced approximately 500 to 1000 ounces of gold. The property is part of Basin #167, Eldorado Valley. The existing manner of use of the underground waters were heretofore appropriated under Permit 54498, all within portions of Section 14,15, 16 and 22, T.22S., R.68E., M.D.B.&M; the use is described as mining and milling, 2 acre feet per year. According to Ruling #4045 there is a positive outlook on “Mining and Milling” permits due to their relatively temporary nature (see “Underground Water Use Permit Denial”). Current annual taxes assessed at $307.30 per year. The mine is for sale. The asking price is $5,000,000 with a retained net revenue interest to the existing owner. Working interest arrangements will also be considered. The next step for the property is to rapidly drill delineate known mineralized quartz vein material and then commence mining on profitable gold-bearing extensions of the historically mined vein that intermittently crop out on the surface for hundreds of feet to the north and south of the old mine workings.